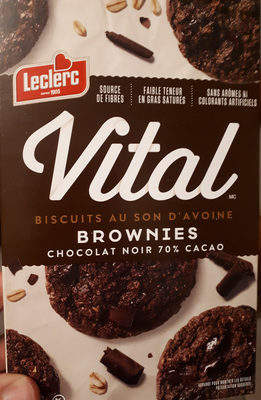 FARINE DE BLÉ ENRICHIE, HUILE DE CANOLA, CASSONADE, MORCEAUX ET BRISURES DE CHOCOLAT NOIR (LIQUEUR DE CHOCOLAT, SUCRE, DEXTROSE, POUDRE DE CACAO, SUBSTANCES LAITIÈRES, LÉCITHINE DE SOYA, EXTRAIT DE VANILLE), SON D'AVOINE, SUCRE, FLOCONS D'AVOINE ENTIÈRE, POUDRE DE CACAO, FIBRES DE BALLES D'AVOINE, OEUF ENTIER LIQUIDE, BICARBONATE DE SOUDE, SEL, ARÔME NATUREL. Product added on December 3, 2018 at 12:29:11 AM CET by rejean. Last edit of product page on December 3, 2018 at 12:35:43 AM CET by rejean.